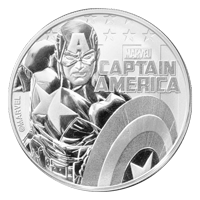 Order your 1 oz 2019 Captain America silver coin from our store online and enjoy the lowest price the web has to offer. The renowned Perth Mint brings you this 6th installment in their exciting Marvel bullion series, in conjunction with the beautiful Pacific island nation of Tuvalu. The reverse feature is a fierce and artful rendition of Marvel’s captain America, shown engaged in battle, dressed in full superhero regalia with his famous shield at the ready. Also on the reverse, the Marvel trademark, as well as the marvel and Captain America brands. On the obverse, a startlingly detailed portrait of Elizabeth II, donning her Girls of Great Britain tiara and courtesy of Ian Rank Broadley, set on a textured field which truly makes the image ‘pop.’ Also on the obverse, Elizabeth II’s name, the coins denominational value and associated country, the year of issue and details of metal weight, purity and content. In the marvel universe, the character of Captain America came into being during the second world war, as a super soldier and is, strictly speaking, the first avenger. Celebrate the elaborate and colourful Marvel universe and fortify your holdings with a 1 oz 2019 Captain America silver coin today. 1 أوقية 2019 عملة فضية لكابتن امريكا Order your 1 oz 2019 Captain America silver coin from our store online and enjoy the lowest price the web has to offer. The renowned Perth Mint brings you this 6th installment in their exciting Marvel bullion series, in conjunction with the beautiful Pacific island nation of Tuvalu. The reverse feature is a fierce and artful rendition of Marvel’s captain America, shown engaged in battle, dressed in full superhero regalia with his famous shield at the ready. Also on the reverse, the Marvel trademark, as well as the marvel and Captain America brands. On the obverse, a startlingly detailed portrait of Elizabeth II, donning her Girls of Great Britain tiara and courtesy of Ian Rank Broadley, set on a textured field which truly makes the image ‘pop.’ Also on the obverse, Elizabeth II’s name, the coins denominational value and associated country, the year of issue and details of metal weight, purity and content. In the marvel universe, the character of Captain America came into being during the second world war, as a super soldier and is, strictly speaking, the first avenger. Celebrate the elaborate and colourful Marvel universe and fortify your holdings with a 1 oz 2019 Captain America silver coin today.